In the early 1930s The New York Daily Mirror, part of the Mirror Holding Corp., purchased a huge tract of pasture and farmland in Parsippany. They dug out 159 acres and erected a dam that formed Lake Parsippany, which became the headwaters for Eastman's Brook. 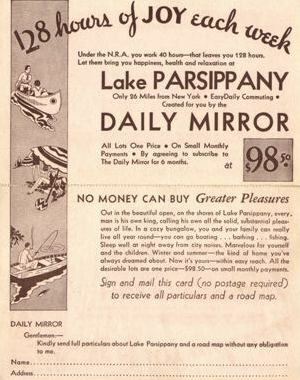 The Mirror Holding Corp. made the 7,916 lots surrounding the lake available to anyone agreeing to subscribe to the Daily Mirror for six months. Lots measured 20 by 100 feet and were offered for $98.50 each. A minimum of two lots had to be purchased in order to build a cabin. Developers Warren and Arthur Smadbeck of New York City handled the sales for the Mirror Holding Corp. Working agents for the Smadbecks in Parsippany were Alex Eckstein and Dean Gallo Sr. By 1933 a sufficient number of properties had been sold. The Mirror Holding Corp. on October 29 1933 held a meeting at Lake Parsippany. About fifteen hundred people attended it. An incorporated organization of lot owners was formed. The Mirror Holding Corp. turned over the property to the Lake Parsippany Property Association. The governing body consisted of five officials and 12 directors. They supervised all Community activities, such as fire and police protection, water supply, sewage disposal, electricity, abatement of nuisances, and compliance with building regulations. The roads and garbage collection were maintained by the association until 1948 at which time they were given over to the town. At the start of the Association if one didn't buy a membership into the association their garbage would not be picked up. The community grew as increasing numbers of city residents retreated from the summer heat. It is interesting to note that most all the lakes in this area are man made including Lake Hopatcong. All but Lake Hopatcong and Mountain Lake are run by associations, which requires membership. There are parts of Lake Hopatcong, which are governed by associations. Mountain Lakes can only be used by its residents.